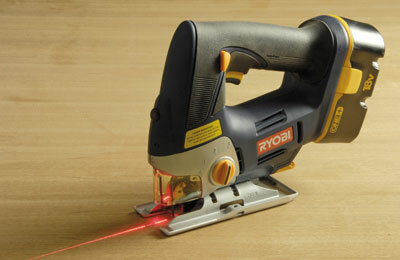 The CJS-180LM One+ Jigsaw & Laser is the latest from Ryobi's ever- improving and expanding One+ range. The previous version, pictured here alongside the new one, proved a good workhorse for general work so I was interested to see what changes Ryobi have made with the new model. It shares some of the same characteristics of the previous jigsaw but there are some significant changes. The quick-change blade system is the same, still works well and will take any type of blade, but this new saw comes with a plastic guard as well as the metal bar used previously. This must be removed to change blades - a job of moments as the guard is sprung fitted and simply pops out. A safety note here: you should unplug any power tool to change blades etc, so you should also take any battery off a cordless tool to avoid any accidental pressing of the trigger! Should you need to cut at 45 degrees, the saw can be set up without using tools. For the laser setup, an Allen key is provided. One of the problems with jigsaws is not being able to see the line you have marked because its gets covered in dust as you cut; however the built-in laser alleviates this problem somewhat, especially when cutting straight work, and I found this useful addition impressive. 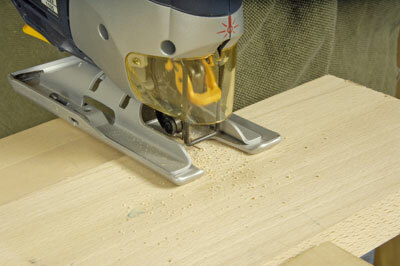 Of course I rarely use a jigsaw for straight cutting as it is difficult to keep a completely square cut in hardwoods owing to the very nature of the blade you are using, but equally, there are many situations when you need to cut curves so this machine, being cordless, could be very useful. 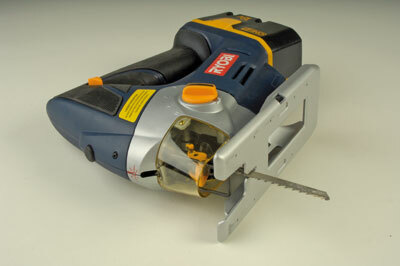 This saw is more accurate than its predecessor and the build quality of the base is far better. The included laser works well on this jigsaw and left an impression on me. This is an excellent saw for general use and has a very good spec for a very reasonable price. Remember though, you do have to buy the batteries separately, but at Â£30 each they're hardly going to break the bank! "This saw is more accurate than its predecessor and the build quality of the base is far better"